Another year has passed by in a jiffy and like every year I feel grateful for another beautiful year gone by. A lot of things happened in the past year that changed me as a person. The blog went through a lot of transition with my two overseas friends contributing a lot of interesting stories from across the globe.But even with all these changes and metamorphosis, one thing that remained constant all this while was my love for sarees. My love affair with sarees is an eternal one and I intend to keep it that way. Owing to this intense love affair, I am always on a look out for sarees and saree manufacturers/ vendors/ designers that put together interesting weaves, designs and ideas to give the saree an interesting makeover. It is so essential to keep reinventing this humble garment for its existence and to make it popular across all age groups and demography. And the purpose of this post, is to talk about one such find. Palam Silks is a name synonymous with quality silk sarees. They are predominantly into diverse designs on Kanchipurams and come up with innovative concepts as designs on Kanchipurams on a regular basis. They even sponsored the silk sarees in the Bollywood movie Chennai Express and were also featured on the Vogue Wedding Show in 2017. They are the biggest patrons of South Indian art and culture and take a number of initiatives to promote and preserve it. Marghazi is a Tamil month which starts somewhere mid December. A music festival is organised every year during this Margazi season in Chennai known as the Madras/Chennai Music Season which is considered one of the world's largest music festival with around 1500 individual performances spanning over a period of 6 weeks. It is basically a Carnatic Music concert which aims to bring together connoisseurs and fans of Carnatic music together to appreciate performances by renowned artists and to give platform to upcoming talent as well. In 2015, Palam Silks, launched 5 mini-buses across the city as a hop-oh hop-off service to these concerts. 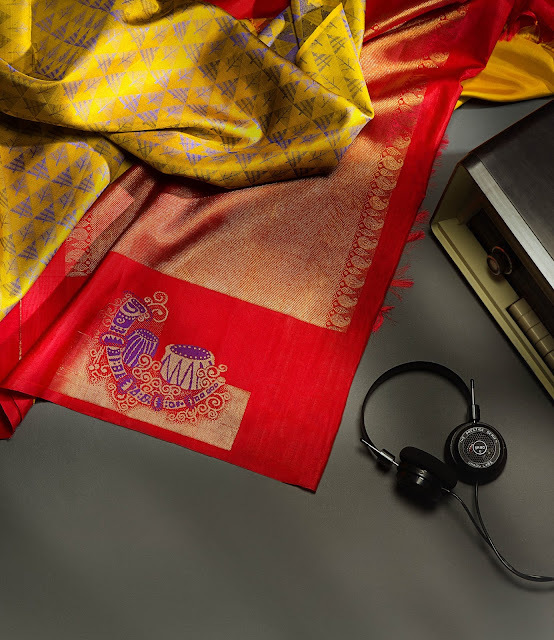 In 2016, as a dedication to all Carnatic musicians and singers, they weaved silk sarees with the musical notations of the 5 quintessential ragas ( Kalyani, Kambhoji, Shankarabharan, Bhairavi, Thodi) as borders on silk sarees. 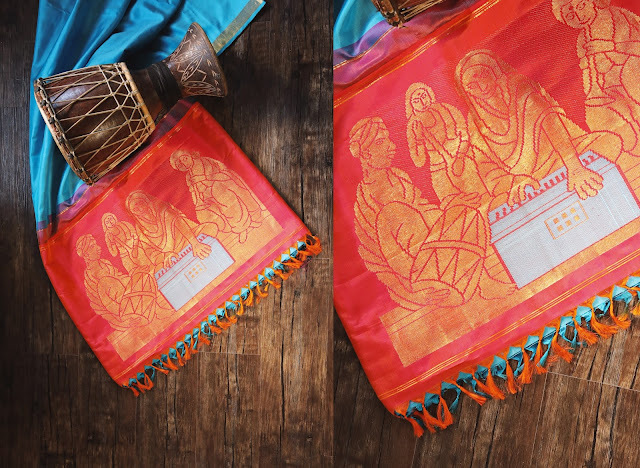 In 2017, they inched a little bit closer to the Katchery (A katchery is an assembly of musicians and audience in the context of Carnatic music or Karnatick music) tradition and specifically weaved a design that music patrons can wear to sabhas. For their 2017 collection, they weaved a scene of a katchery with musicians seated across the stage with the instruments during their performance. This collection also carries folklore musicians and unique and rare musical instruments in the design palette. The saree is woven in turquoise green with a stark black pallu and on the border of the saree carries a box bhutta of folklore drummers performing in a street theatre. Here you can see the pallu is a rich sky blue kept plain and the pallu of the saree carries intricate zari weaving of carnatic musicians performing and the harmonium is specifically woven in blue silk threads. Here the body is woven in deep purple with the pallu in aqua green and the pallu carries exquisite twin shaped evens in the form of peacocks. A unique instrument that is a rare find. 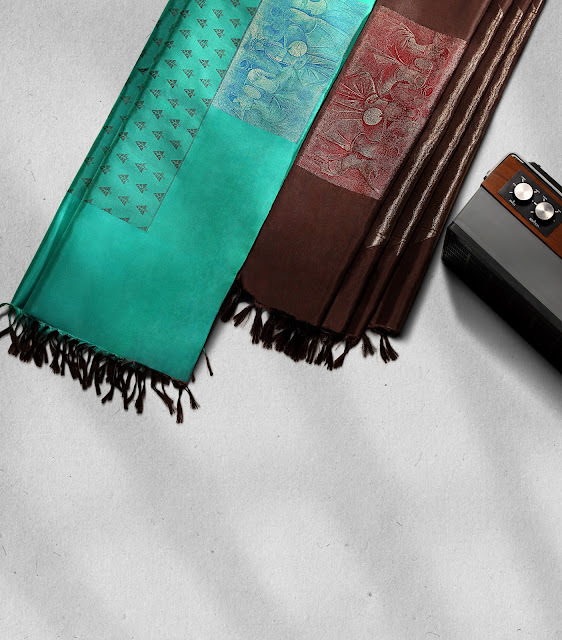 The collection consists of pure kanchipuram silk sarees. 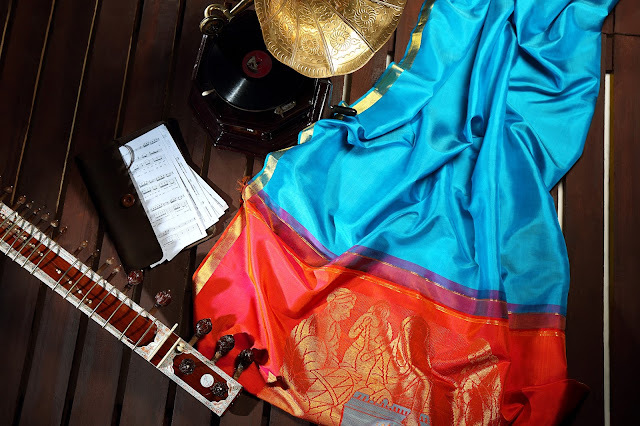 The sarees are plain with a rich pallu carrying the scene of musicians performing on the pallu. This design is put together with zari and silk thread work. Priced between 10,000 to 15,000, these sarees are a complete steal. For more details, do visit their FB page and Insta handle. Their sari's really do look beautiful! !